I find it’s always a good idea to work with a concept when taking on a fashion shoot. 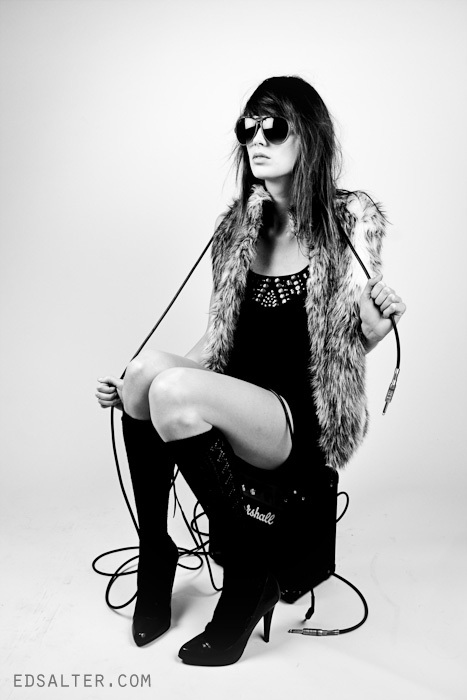 This test shoot was to the theme of ‘Rock Chic’. The shoot was all done in my studio near Oxford with one or two studio strobe mono blocks, depending on the shot (Elinchrom 250 and 500 head). Most of the shots were with just one Elinchrom 500 head with a shoot through umbrella, some shots used a soft box too. The great thing about a shoot though umbrella is that it is very portable, though it didn’t really matter in this instance it just creates a nice light. This shot was taken at F/6.3, 1/100 second, 55mm at ISO 100. This create just enough depth of field that all of the face is in focus but the hair starts to go out of focus. I wanted to create a really graphic image and the black cables against the white background achieve this. 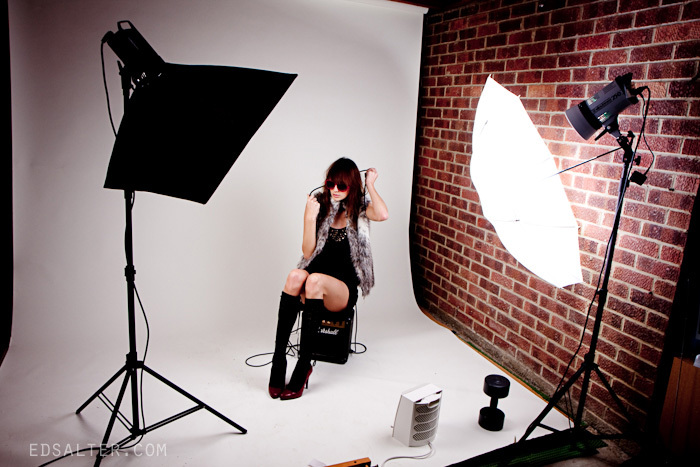 A little look at the behind the scenes setup, note the fan heater essential to keep the model happy! I fire the strobe heads with Elinchrom Skyports radio triggers, this reduces the number of cables to trip over around the studio and allows me to move around the studio freely. We had a lot of fun smashing up an old record, again the contrast of the stark black against the white background works to create an effective high contrast image. Since I did this shoot I have produced prints of these photos, if you are interested please contact me. Hey great tutorial! I’m an extremely newbie with strobing. What output did you use for both of your strobes??? I’m guessing the left side is lower f stop than the one in the shoot through umbrella? I appreciate your reply! Hi thanks for your comment. I typically use about half power on the heads, which gives around F/8 at ISO 100. When using both heads they were at about the same power, but in some of the shots I used only one head to get a more dramatic lighting style. Hope that helps! seriously a huge help for my fashion spread! Amazing Photograpy! Very good help for my Fashion homework. love the shots! I want to know what kind of material your backdrop is, because I use muslin backdrops and I can’t stand them, they absorb all the light instead of reflecting it. Hi Tamara. I use 3 meter wide paper rolls to shoot on. Be careful you are not overexposing your background lights, this should reduce the reflection. do you have prints available for purchase? been trying to get a hold of you. love your work! I have sent you an email Jena, thanks! Sure I would love to see them, can you reply to my email with pictures attached? You can pickup a basic flashgun and an umbrella for less than £100 which would be a good start. Otherwise you could try using a large white bedsheet held up by some kind of frame in the sun to create a nice soft light. Whats the name of the model?? ?